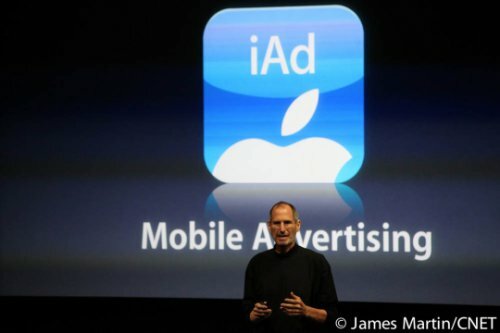 Apple introduced its “iAd” mobile advertising platform, which will allow third-party developers to embed advertisements within mobile apps, as part of iPhone OS 4. According to Apple CEO Steve Jobs, the iPhone and the iPod Touch could generate up to 1 billion Ad impressions per day, if users spent an average of 30 minutes engaging with advertisement-seeded apps. This would mean a large sum of money. Brian Marshall an analyst with Broadpoint AmTech noted: "It is in our view Apple’s new mobile advertising platform (‘iAd’) stole the show and will be significant to the financial model. In fact, we believe the iAd platform could generate an incremental $2.5 [billion] in revenue and $1.00+ to Apple’s financial model when the business hits its stride." Marshall added: "If Apple is unable to continue designing leading-edge consumer products for mass markets, this would clearly negatively impact the financial model and result in a lower target price for Apple shares." Due to be released this summer, the iPhone OS 4 will feature the "iAd" platform and several updates like multitasking, an ability to collect mobile applications in specific folders, a unified inbox for e-mail, and a social-gaming hub. Jack Gold, an analyst with J. Gold Associates commented: "The iAd is a big step for Apple—their way to stick a finger in the eye of Google, and even MSFT (Bing). Sounds like the only ads going to iPhone and iPad ultimately will be through Apple’s ad-equivalent of iTunes monopoly for music. This is a game changer, and I’ll bet someone legally challenges this monopoly position (probably in Europe, where iTunes is being heavily challenged)."